From time to time, I participate in technical book reviews. Here is my account for a book I've recently reviewed. Pattern galore, a term that aptly describes one of the worst nightmare of software craftsmen. No-one wants to come close to a system that has been dragged into a design hell created by pattern-overenthusiastic programmers. A craftsman wants his design to be constrained by requirements and his code to be written by hand. Alas not all code is born equal. Some languages and platforms insist on the creation of tedious scaffolding code before starting to tackle the real meat of the problem. And large projects imply the repetition of this code ad nauseam. Moreover, many have been lost in the quest for the long sought holy grail of code re-use. 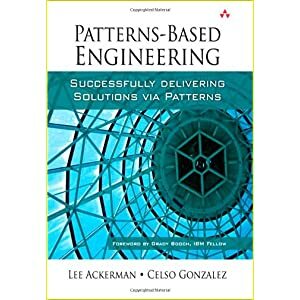 Not deterred by this difficult context and heavy history, Ackerman and Gonzalez have decided to present a pragmatic approach to using patterns in software engineering. And they did great. In truth, Patterns-Based Engineering is faithful to its tagline: Successfully Delivering Solutions via Patterns. Rest assured that snake-oil is not in the catalog of the authors: the book is as concrete as possible, organized as a manual for kick-starting a rational approach to using patterns. The authors took time to debunk pattern-related misconceptions and, this, for a reason: there is a lot to do to polish the image of design patterns. I believe this book is an essential first step in the right direction. Posted by Unknown at 9:54 a.m.
DevOps: Time for Agile Operations!